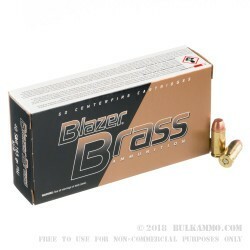 Blazer Brass ammunition is good quality target ammo in reloadable brass cases. Its affordability makes it easy to buy in bulk. 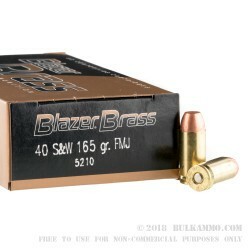 CCI keeps the cost of Blazer Brass down by using a total metal jacket plating on each bullet. This method costs less to produce, but renders the bullet unsuitable for ported barrels, which can shear the plating. 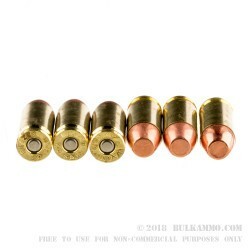 However, the total metal jacket also comes with a benefit: it covers the base of the bullet, providing an added safety benefit by reducing potential lead exposure. Expect a muzzle velocity of about 1050 feet per second with this standard 165 grain bullet. Each box holds 50 cartridges. CCI is a well-known manufacturer of high quality rimfire ammunition as well as economical centerfire pistol cartridges for range practice. The company is headquartered in Lewiston, Idaho near its sister company, Speer Bullets. Both companies currently operate as divisions of Alliant Techsystems but retain their original facilities and distinct brand identity. 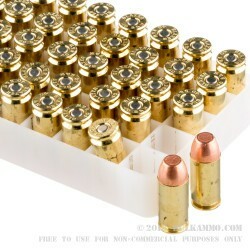 CCI ammunition is known for its unerring reliability, superior quality, and reasonable, midrange price point.